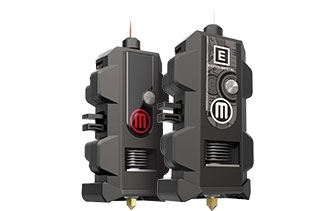 The MakerBot Labs Experimental Extruder is designed for the advanced user looking to push the limits of what's possible with MakerBot 3D printers. Customize your 3D printing experience with a modifiable hardware design and interchangeable nozzles. A Modifiable Smart Extruder for the Advanced user - capable of experimenting with a range of 3D printable materials. With access to new print modes in MakerBot Print software the advanced user has the ability to change nozzle type and diameter to suit specific material choices.